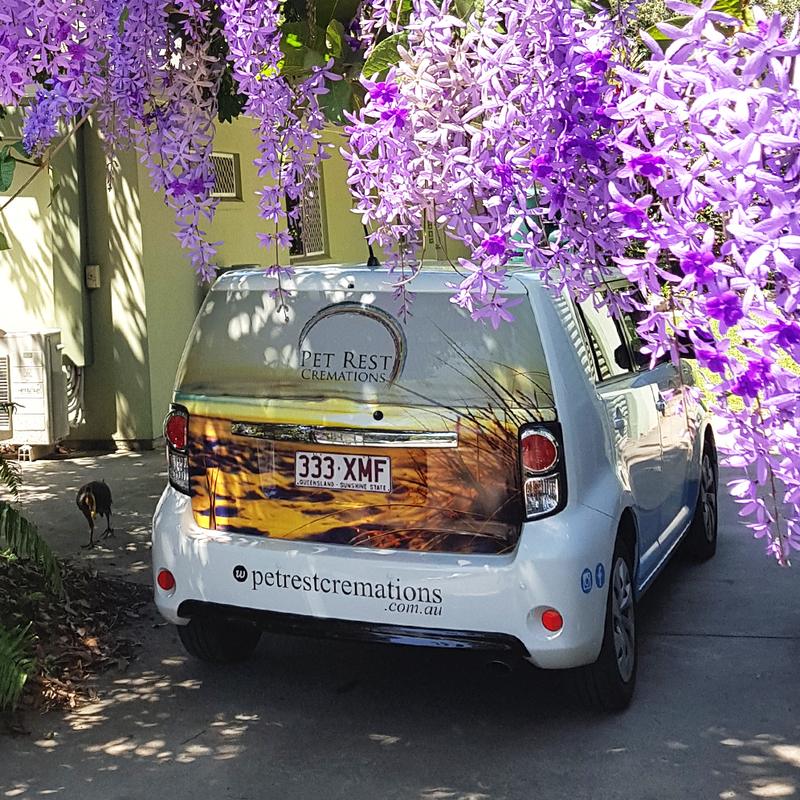 Pet Rest Cremations is located on Sippy Creek Rd, Tanawha within the same grounds as the Sunshine Coast Animal Refuge. Sippy Creek rd is approximately 1km north of Aussie World. *With the Bruce Highway upgrade continuing, we have a new access road via Wilsons rd, Tanawha. 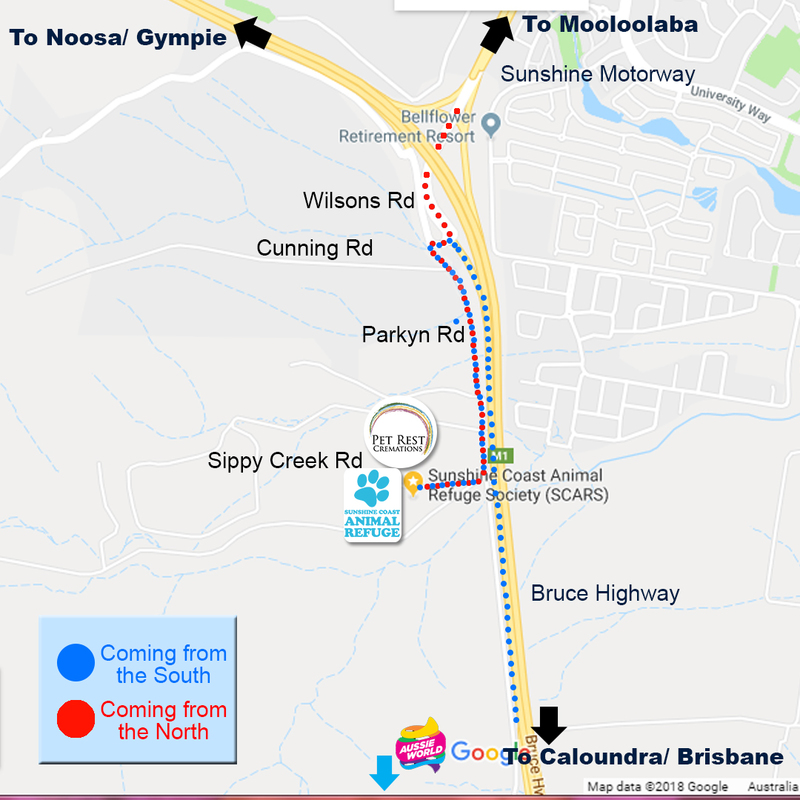 As it is a brand new road, your GPS will try and take you via Frizzo road, however if you take the Buderim exit (EXIT 194) off the Bruce Highway (coming from South) and immediately take the Wilsons rd/Cunning road turnoff to the left and then keep left around until you are driving parallel to the highway again. Sippy Creek rd is then on your right approximately 500m. You will see signs directing you to our office. On the road the new direction is fairly straightforward however please don’t rely on your GPS as it will take you to the wrong area. If you have any difficulties, just call the office on 5439 6111 and someone will help you. Word of mouth, Facebook and Google reviews really help out our family business. Is Pet Rest Cremations run by the Animal Refuge (SCARS)? No, we are located within the grounds of the Sunshine Coast Animal Refuge and greatly value the relationship we have with the organisation and volunteers. Payment options are Credit Card, EFTPOS (bank surcharges apply), Cheque (cheque payments to be made to: Pet Rest Cremations) or Cash payment. Do we offer Pensioners Discount? A 5% Pension discount rate is available on Veterinary Clinic’s endorsement of ownership of Pet and proof of pension eligibility. Definitely, we can come and visit you at home or to your chosen clinic- just whatever is going to feel right for you and your beautiful friend.